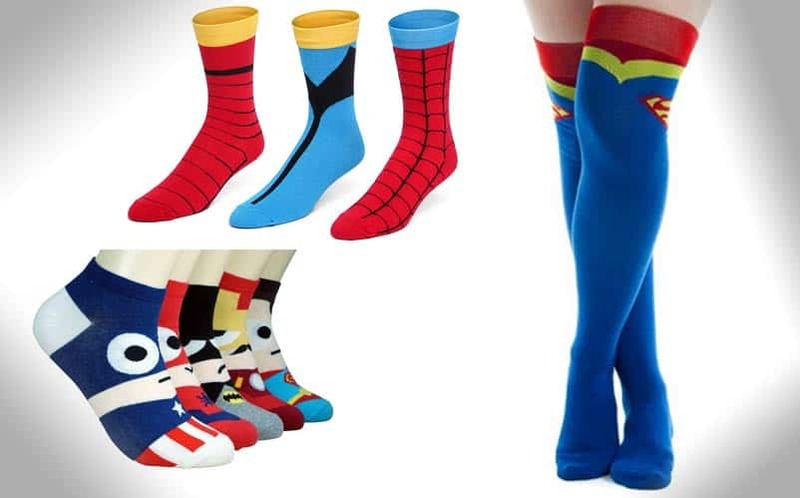 Cool Superhero Socks to Buy | Nerd Much? One of the most commonly gifted items over the holidays is socks. And while some people are perfectly fine wearing their all white Hanes ankle socks, we’re not — we want something cooler. Some retailers carry some fun designs in the story, but for the ultimate selection, you’ll want to take your sock shopping to the wonderful world wide web. If you’re looking for cool superhero socks, we can point you in the right direction. There are plenty of awesome, ultimately nerdy pairs of shoe underwear (see what we did there?) in internet shops all over the world, and we’d simply hate for you to get stuck with a crappy pair under your Christmas tree this year. Seriously, can you think of anything more horrific than getting a crappy pair of socks? We’re almost finding it impossible to create any of these shopping lists without including items from ThinkGeek. Obviously, they’re the reigning king of cool nerdy stuff. 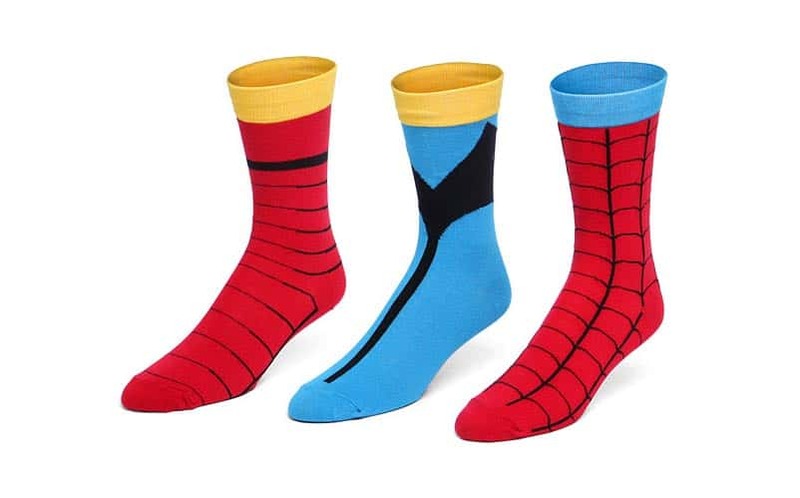 Socks are no exclusion, either, as they have a set of three Marvel superhero socks, including designs for Spider-man, Iron Man, and Wolverine. They’re made out of a cotton/polyester/lycra blend and stretch to 11″ in length. They fit men’s shoe sizes up to 11, and women’s shoe sizes up to 12+. The CW’s The Flash series has definitely skyrocketed The Flash’s popularity over the past year. 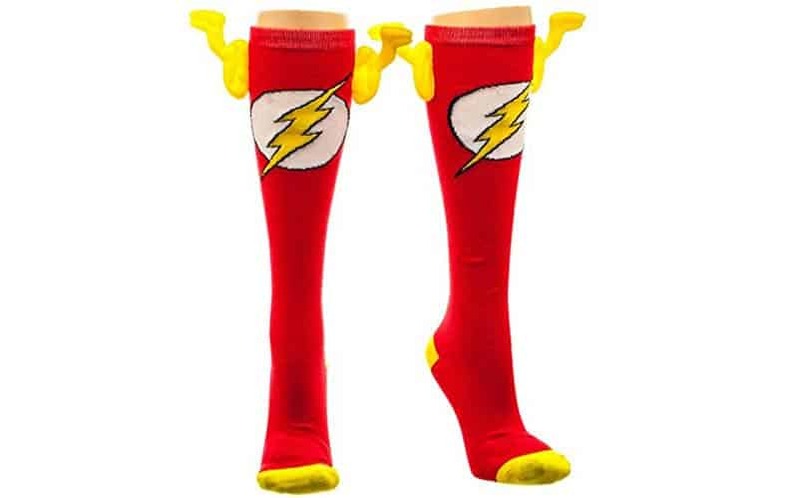 And if you’re one of the many jumping aboard the Barry Allen train this year, pick up a pair of The Flash Wing Socks by DC Comics’ official store. They have cool wings on the sides to replicate the Flash’s mask. They’re comfortable, and they’ll fit shoe sizes up to 10. The thought of capes on socks is ridiculous, sure, but you’ll have so much fun wearing them that you won’t care. 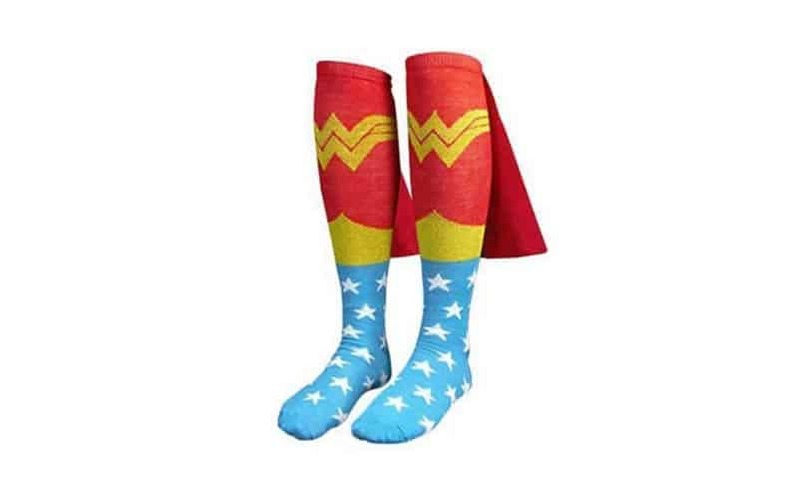 These cool superhero socks are modeled after Wonder Woman, with white stars on a blue background and the yellow gold Wonder Woman logo on red. Each sock has its own red cape to match Wonder Woman. They’re officially licensed by DC, and they’re made out of cotton. And, most importantly, they’re highly reviewed. Captain America’s popularity is at an all-time high, thanks to his many appearances in the Marvel cinematic universe in his own movies as well as the Avengers and the upcoming Captain America: Civil War. He’s cool; we like Cap. 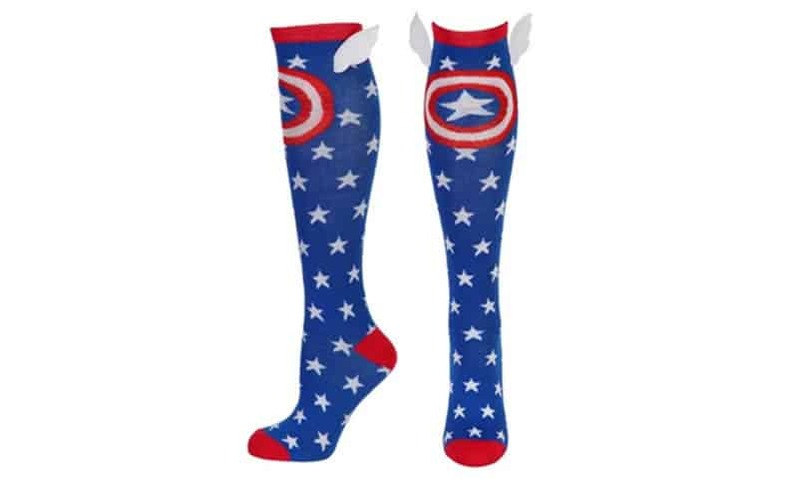 Each sock has its own pair of wings at the top, and the socks sport Captain America’s iconic blue, white and red shield at the top. These socks are 68% acrylic, 30% polyester and 2% spandex for the ultimate in soft comfort for your feet. They’ll fit shoe sizes up to size 10. 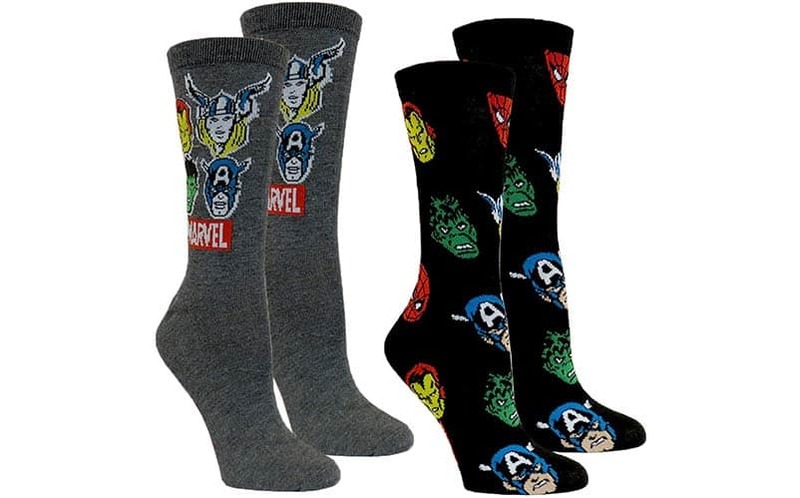 If you’d rather have all of the Avengers on your footsies, check out this two pack of Avengers socks. They’re available through the official Marvel store, and they both have great designs on them (although, in all honesty, I’d say that the black pair is much cooler). Either way, you’re getting Spider-Man, Captain America, The Hulk, and Iron Man on one pair, with Thor, Iron Man, The Hulk and Captain America on another pair. They’re 97% polyester and 3% spandex, making them great for all day comfort while you fight your daily villains. It’s undeniable that Kara Zor-El’s popularity has skyrocketed since October, thanks to CBS’s new Supergirl TV series. 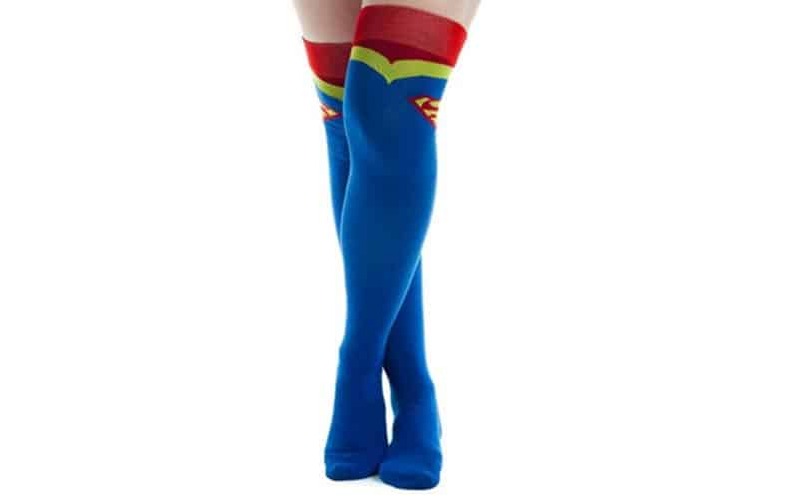 Now, own a pair of super high Supergirl socks. They’re officially licensed by DC Comics, and they look great whether you’re 5’2 or 6’1. These Supergirl socks are incredibly comfortable, and they’re highly reviewed. Having to choose between DC Comics and Marvel Comics is an age old problem that has been around for decades. But why choose when you can have both! 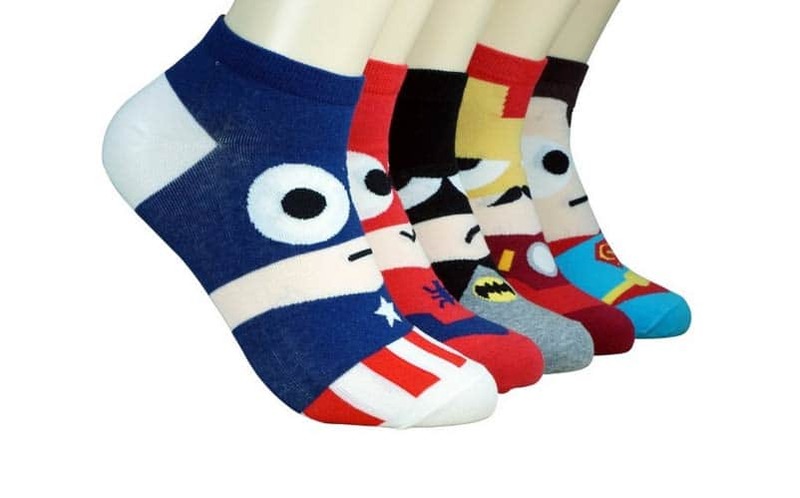 With the Dasom Cute and Fun Socks, you get Batman, Superman, Iron Man, Spider-man and Captain America all in one low-priced set. Honestly, they feel like the Funko Pop version of socks (although Funko has nothing to do with their creation). Still, their cutesy style makes them all cool superhero socks.